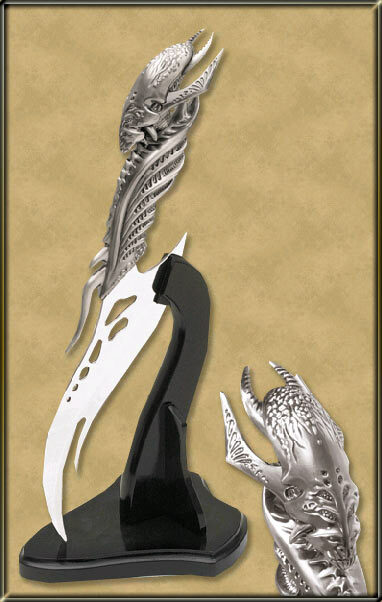 This wicked knife , designed by fantasy artist Kit Rae , features a solid metal handle with incredibly detailed sculpturing and a brushed finish. The stainless steel blade features a highly polished mirror finish. The hilt of this baneful dagger was forged in the shape of the Orwenoch , a horrid creature that dwelt in the underworld long ago. The Shadow Slayer dagger was given the power to bring forth the spirit of the Orwenoch to slay ones enemies. Each piece is branded with the designer's trademark and includes a parchment certificate guaranteeing that it is a genuine original. Includes a wood display stand with a woodgrain, burned edge finish. This collectible pin is an exact miniature replica of the Shadow Slayer. The pin is 2-3/8" overall , constructed of die-struck metal with nickel plated finish and double posts with clutches on the back to hold the pin securely in place. This collectible pin is great for the knife or pin collector , as well as being an excellent promotional tool. Pin Material: Die-struck metal , nickel plated.